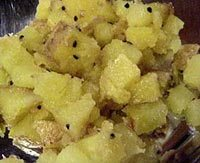 This is a typical Bengali recipe. Goes well with rice and Daal and should be served hot. 1 medium onion chopped fine. 2 ½ tbsps mustard oil. ½ cup khuskhus (poshto) soaked in a little warm water. Grind 2 green chillies along with the khuskhus (poshto) to a fine paste using little water. You can parboil the potatoes in salted water if you wish; this will reduce the cooking time. Next heat the mustard oil and add kalonji seeds in it and leave to crackle. Then add the chopped onions and fry till soft. Next add the slit green chillies. Next add the potatoes and stir fry for 3 mins. Then add the ground khuskhus (poshto) and stir. Add salt and sugar acc to taste. Add a cup of warm water and bring to boil. Cover the pan and simmer gently till ¾ of the water dries off. Check if the potatoes are fully cooked. Before removing from heat, pour a little mustard oil. Gud recipe . Is it necessary to use only mustard oil ? Ami mishti bhalao bhashi .